If you’ve had a bit of rain, it’s easy to forget that winter veges need feeding. Here, in Melbourne, everything is looking very lush but, if you want productive winter vegetables, herbs or fruit trees come spring, you need to feed them once a fortnight or so. As manure is a bit strong for this time of year, I use Seasol or Charlie Carp liquid tonics (apparently they are not fertilisers because they don’t contain nitrogen or phosphorus), taking advantage of the excess of rainwater in my tanks. You need to feed for two reasons: one, a lot of rain strips the soil of nutrients and two, if you haven’t had rain, your plants will need feeding AND watering. Both the above tonics are also good for seedlings, natives and rhubarb (which doesn’t like strong feeding at any time). 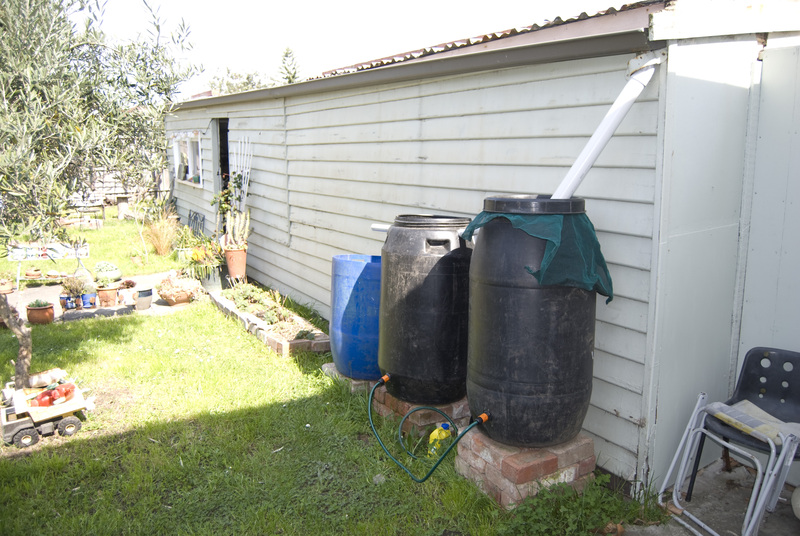 Below is an early picture of my ‘rainwater harvesting system’ (just after we’d set it up, so probably June/July 2011). I don’t have proper tanks (much as I covet them), because I’m a renter, so I am able to move this ‘system’ from house-to-house and adapt it to any context. Another advantage of my overflow system is that the last tank is open, so I simply pour a fair dollop of Seasol into the tub, mix it around a bit, and give my veges, natives and herbs their fortnightly meal via watering can. Early days, and the launch of the ‘rainwater harvesting system’. Postscript: Not only was Charlie Carp invented by the uncle of a friend of mine, its production and use is helping in ridding Australian waterways of the noxious European carp.